Lonnie Wheatley, GREENWOOD, Neb. (April 4, 2015) – Brian Brown denied a last-lap bid by Danny Lasoski to complete a sweep of the weekend’s Spring Meltdown with a triumph in Saturday night’s 20-lap Nebraska 360 Sprints feature at I-80 Speedway. 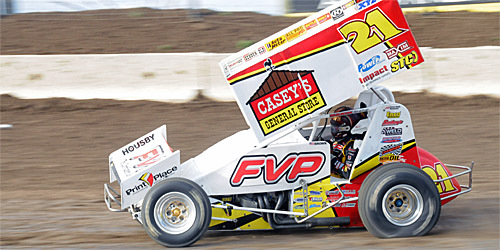 After snapping an I-80 victory drought of nearly three years on Friday night, Brown led all the way in Saturday’s finale to pocket another $2,200 aboard the FVP/Casey’s General Store/Printplace No. 21 Maxim. Brown bolted into the lead at the drop of the green flag from his front row outside starting position with Lasoski making a quick move from fifth to second on the opening lap. With the low line the preferred line on the wind-blown surface, “The Dude” put on the pressure almost immediately and had slipped into the lead on the seventh round only to have the move negated by the first of two cautions. With Brown vigilantly protecting the low groove, the nephew-uncle duo slipped away from the field on the restart for several laps before Dusty Zomer entered the mix. Disposing of Jody Rosenboom for third after the lap seven restart, Zomer closed in on the lead duo and had just made it a three-way duel with traffic in the mix when a final caution flew with just five laps to go. Brown and Lasoski slipped away again in open track on the final restart, with Lasoski shadowing Brown’s every move until the final circuit. Taking a shot at the win, Lasoski moved the Creason Motorsports No. 33 up a groove in the final pair of corners and charged off the final corner nearly alongside Brown. Lasoski’s last-lap effort fell less than a car-length short at the line with Zomer bringing the Buffalo Wild Wings machine home third. Clint Garner crossed the stripe fourth with Lee Grosz rounding out the top five as eighth-runner Davey Heskin slowed on the final round. Heskin’s Friday effort was cut short by a blown engine in heat race action. 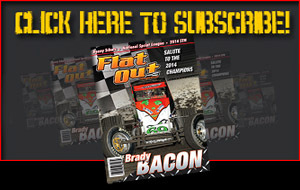 Heat Winners (starting position in parentheses): Lee Grosz (6), Dusty Zomer (3), Danny Lasoski (2), Wade Nygaard (2). Heat Moments: Third-row starter chased down Ian Madsen on the white flag lap to win the first heat, Dusty Zomer distanced himself from Friday night winner Brian Brown in heat two, Billy Alley zipped past Danny Lasoski on the opening round only to have “The Dude” battle back for the win in the closing laps and Wade Nygaard dominated the fourth and final heat. “B” Main Winners (starting position in parentheses): Ryan Roberts (1), Cody Ledger (1). “B” Main Moments: After Dakota Hendrickson got upside down, Don Droud, Jr., fended off Bryan Gossel for the second and final transfer in the first “B” won by Roberts while Ledger fought off Josh Baughman for his second “B” win in as many nights. Lap 6 – Wade Nygaard slows with a flat left rear tire. Nygaard rejoined the action only to pull pitside two laps later. Lap 15 – Eric Lutz rolled to a stop in the Swanson No. 24bh just past the turn four pit entrance. “A” Main Hard Charger: Cody Ledger picked up the most feature positions by racing from 18th to tenth. Heat One (8 Laps): 1. 4J-Lee Grosz, 2. 18m-Ian Madsen, 3. 13v-Seth Brahmer, 4. 53b-Joe Beaver, 5. 5h-Dakota Hendrickson, 6. 41-Jeff Carlson, 7. 12-Tyler Drueke, 8. 5x-Jason Martin, 9. 1b-Toby Chapman, 10. 03-Shayle Bade. Heat Two (8 Laps): 1. 82z-Dusty Zomer, 2. 21-Brian Brown, 3. 2d-Duty Ballenger, 4. 17b-Ryan Bickett, 5. 75-D.J. Brink, 6. 99-Tony Rost, 7. 94-Don Droud, Jr., 8. 15-Joe Riedel, 9. 612-Jeff Schreurs. Heat Three (8 Laps): 1.33-Danny Lasoski, 2. 3-Billy Alley, 3. 24bh-Eric Lutz, 4. 18-Ryan Roberts, 5. 35L-Cody Ledger, 6. 17-Josh Baughman, 7. 6g-Bryan Gossel, 8. 76-Jay Russell, 9. 68+1-Blain Peterson. Heat Four (8 Laps): 1. 9-Wade Nygaard, 2. 14r-Jody Rosenboom, 3. 40-Clint Garner, 4. 56-Davey Heskin, 5. 82-Jordan Boston, 6. 14j-Josh Riggins, 7. 77-John Klabunde, 8. 6-Kaden Taylor, 9. 93-Ryan King. First “B” Main (12 Laps – Top 2 advance to “A” Main): 1. 18-Ryan Roberts, 2. 94-Don Droud, Jr., 3. 6g-Bryan Gossel, 4. 76-Jay Russell, 5. 14J-Josh Riggins, 6. 99-Tony Rost, 7. 1b-Toby Chapman, 8. 41p-Jeff Carlson, 9. 5h-Dakota Hendrickson, 10. 93-Ryan King. 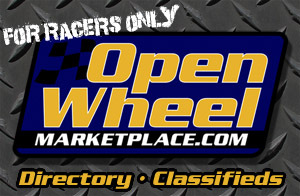 Second “B” Main (12 Laps – Top 2 advance to “A” Main): 1. 35L-Cody Ledger, 2. 17-Josh Baughman, 3, 75-D.J. Brink, 4. 12-Tyler Drueke, 5. 5x-Jason Martin, 6. 77-John Klabunde, 7. 6-Kaden Taylor, 8. 15-Joe Riedel, 9. 612-Jeff Schreurs, 10. 03-Shayle Bade, 11. 68+1-Blain Peterson. “A” Main Finish (20 Laps): 1. 21-Brian Brown (2), 2. 33-Danny Lasoski (5), 3. 82z-Dusty Zomer (3), 4. 40-Clint Garner (4), 5. 4J-Lee Grosz (8), 6. 14r-Jody Rosenboom (1), 7. 18m-Ian Madsen (9), 8. 3-Billy Alley (7), 9. 17b-Ryan Bickett (11), 10. 35L-Cody Ledger (18), 11. 53b-Joe Beaver (16), 12. 13v-Seth Brahmer (10), 13. 2d-Dusty Ballenger (13), 14. 94-Don Droud, Jr. (19), 15. 18-Ryan Roberts (17), 16. 82-Jordan Boston (15), 17. 56-Davey Heskin (12), 18. 24bh-Eric Lutz (14), 19. 9-Wade Nygaard (6), 20. 17-Josh Baughman (20). Lap leaders: Brian Brown 1-20.